Dysgraphia can affect many people in various ways…it is generally regarded as deficiency/learning difficulty in the ability to put pen to paper in terms of the written word. It can be a handwriting issue, or a cognitive issue (transcription difficulty)…taking thoughts from the mind or indeed the teacher and putting them down on paper, and this can also be down to agraphia. It must be mentioned that as with dyslexia most students have very high intellect; this causes many teachers to believe the student lacks interest or is lazy; this is far from the truth, they have great ideas until it comes to the art of putting pen to paper. Again like dyslexics they are the ones that create the idea in group discussions and are great at the practical side of projects but cannot write a report etc. We all have moments when our mind goes blank whilst writing or in conversation… with dysgraphia and agraphia this is more profound and on-going. One of the problem areas is the using of graphemes (single letter and often silent in writing – as in debt). Although this is thought to be very much of a cousin to dyslexia, it does not actually bear any relation in so far as many with Dysgraphia and Agraphia students have little if any problems with their reading or spelling. Dysgraphia is, as mentioned, a lack of connection from the information stored in our brain and the lack of moving that information when commanded by the brain to the hand (fine motor)…this can be seen as comorbid (exists with other conditions) as it can be seen in children/adults with poor motor skill, such as DCD…Verbal Dyspraxia…ADD…ADHD. Agraphia, whilst having the same symptoms as dysgraphia, is often caused by damage to the temporal or parietal lobes and also in the motor cortex, which can be as a result of a stroke or other brain injuries. Although we talked about high intellect earlier, this can co-exist with dyslexia in some cases. Poor motor skills can result in dysgraphia due in part to immature fine motor skills and poor co-ordination (dexterity)… the most common being weak hand/arm muscles. Poor posture can also add to this, especially in DCD children and adults…they tend to tire very quickly and their writing space becomes very crowded. Students can often present with poor writing and this is down to spatial and even scoptopic issues (visual stress)…they can view the paper as if its tapered top to bottom and their writing moves away from the margin…or their writing simply gets bigger as they work across the page. Taking down the written word requires huge concentration and you can often find that writing starts off fairly legible and then quickly deteriorates…it can also become slow and laborious due to poor retention of the information being dictated or from a whiteboard, etc. It is worth checking to see if your child is writing with the correct hand…I too often find that a left dominant student is writing with the right hand and this was never corrected at the early stage of learning to write. Students who work head down covering their work…this is often through embarrassment (fear of their peers looking at their work and making negative comments). Crabbing the wrist and fingers whilst writing…could also be a sign of using the wrong hand to write with. Fingers tiring quickly (hand shaking) when writing even short passages of texts. Constant correction of work (tipex-ing or rubbing out). Moving to upper and lower case in the same word. Letters growing in size or, as mentioned, moving away from the margin (visual stress). 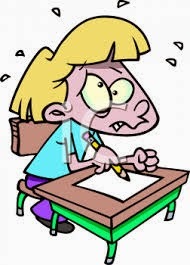 Inability to keep up with teacher or peers dictating (writing speed). Lack of attention to detail (just want to get it over with). Constantly looking to the board to re-affirm words (also poor short term memory can cause this). Faint and illegible writing (can also be due to poor coordination and pressure on the paper). Poor handwriting (can so often lead people to believe that the student is dyslexic). Poor Comprehension…unable to build a story from scratch. Students often complain of feeling tired and will yawn a lot while writing. By introducing gross and fine motor exercises…this will improve posture and also arm, wrist, hand and finger strength and as well as reducing fatigue. Using whiteboards to practice on and gain correct tip pressure of pen or pencil. Introducing pen and pencil grips or stubby pens and pencils. Using a multi-sensory teaching package. Having a test for visual stress and the possible introduction of filters and coloured writing books. Students with learning difficulties put far more effort into everything they do even though on the flip side teachers will often disagree…these students are, as previously mentioned, very clever and will in usually excel in subjects other than those that involve writing copious notes. Delivering very visually stimulating and kinaesthetic type projects are so important. Memory recall work is also important to grow confidence in students with dysgraphia, we at dyslexia Dublin have great results in this area. Dyslexia Dublin.ie carries a huge range of resources to help with Dysgraphia and we ship worldwide. Please feel free to comment on any of our posts…the information we use in our posts is that of our own opinion and research and occasionally will include the work of others. It is for reading and guidance only and should never be taken literally.